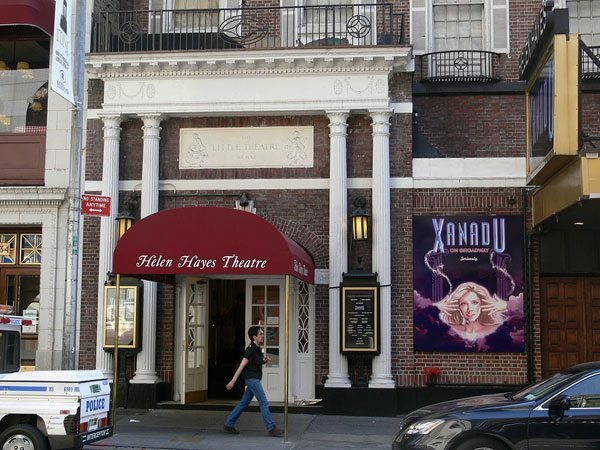 The Helen Hayes Theater opened 106 years ago as the Little Theater, “the smallest house on Broadway.” Michael Paulson reports in the New York Times that the theater is “about to reopen yet again, this time run by a nonprofit. The theater, operated by the Second Stage Theater company, becomes the sixth of Broadway’s 41 officially designated theaters to be nonprofit-operated. Among them, you’ll find the holdings of the Roundabout Theatre Company (which operates three theaters), Lincoln Center Theatre, and the Manhattan Theatre Club. And, though it’s technically an “off-Broadway” theater, one can’t deny the influence of another New York City nonprofit theater company—the Public Theater, which famously premiered Hamilton before it moved to Broadway. Outside New York City nonprofits dominate the theater industry. However, most Broadway shows are run on a for-profit basis. As Variety noted a few years ago, three companies—Shubert Organization, the Nederlander Organization, and Jujamcyn Theaters—own most of the venues, which they then lease out for individual productions. As of 2012, these companies operated 31 of what were then 40 Broadway theaters (with Shubert running 17 theaters, Nederlander nine theaters, and Jujamcyn five). Typically formed as a partnership or company or produce one play only and then disband. Theoretically continues forever. Usually produces a slate of plays each season. A production is often planned as an open-ended run, playing for as long as ticket sales support it. A production is rarely planned as an open-ended run; not-for-profit theaters generally have closed runs, with established ending dates. Producers do not necessarily own and operate the theater where the show is playing After the starting years, most groups own or lease long-term and maintain their own theater space. Box office results determine if a show runs. Only 40 to 60 percent of the budget comes from box office. Profits for investors are taxable; losses are deductible for the most part. Income in excess of costs is called “surplus” and is maintained by the theater for another use. Donations to the not-for-profit theater are deductible for the most part. Second City paid $64 million to obtain the 589-seat capacity Helen Hayes Theater. About 83 percent of that amount has been raised so far. Fundraising continues with the goal of retiring the remaining debt. The building, whose name currently honors actress Helen Hayes, could “be renamed if and when a donor steps up to buy the rights,” notes Paulson. The original theater was built by Winthrop Ames, a wealthy producer, director and playwright. The theater opened with only 299 seats. President Woodrow Wilson was an early patron and the theater also included “a custom-designed seat up front to accommodate J.P. Morgan,” the famed financier. In 1920, a balcony was added, which increased the theater’s capacity to its current size. Converting an independent theater in Monterey, California to nonprofit ownership could ensure it remains a community asset for future generations.